The Candle in the 10 C's of Survival really refers to Candlepower, or Illumination. Although a genuine candle is useful for this, in an urban day to day situation, like trying to find your seat in the cinema, it is somewhat frowned upon to light up a candle and is safer for everyone if you stick to using a torch instead. A lot of people carry the small keyring type LED lights to help get their front door unlocked in the dark and there is certainly no harm in having one of those and maybe keeping one on the zip of your pack too. When it comes to torches it really is a case of getting what you pay for. Although the cheap CREE torches from china are well worth the £2 they cost, they don't have the best reliability or the longest service lives. If I'm going to carry something every day I'd rather know that I can depend on it when it counts. 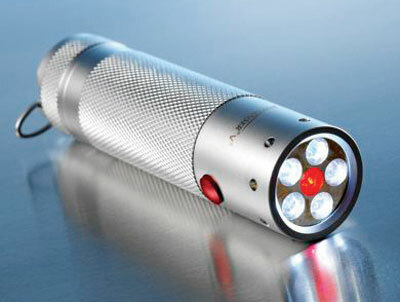 My EDC go-to torch is the LEDLenser Aviator, it is well built, functional and affordable. Housed in a splash proof aircraft grade aluminium body, It features two different light settings, Five high intensity white LED's for an ultra bright beam plus the added bonus of a high intensity red LED light to aid enhanced night vision. Love to hear your thoughts as always, do you carry a torch? We have a few good quality torches (lenser and I just checked they are genuine luckily!) P7 in the car and one in the house and then a few P3 to carry around. I also have a couple of head torches that I use daily, I would be lost with out them, my orchard was planted by torch light! My mother brought me a rechargeable LED floodlight for christmas and that is amazing, last ages and gives out a good light. Also got a box of candles under the stairs because that's what power cuts are about! Along with glow sticks for the kids to make it fun for them at a low cost. Also works as a great night light for them.